Cubswin11 wrote: Fangraphs has him as a 70/70 on speed. I’d assume that’s based on some numbers they have access to or talked to guys about and this is likely Law just going all in one way on a guy that he does often. There's been better reports on Nico since he started, hasn't there? He got out to an awful start (which we think is when Law saw him) but there's been some better things said about him as its gone on and he's performed well. I don't think he's ever going to be a great player, but think he can be a first division starter especially on his rookie deal as like your ~5th best position player. I could see him being somewhere around what Brandon Crawford or Chris Taylor were this year with maybe a little more contact/BA and less HR's (but maybe more 2Bs to keep the SLG up), which if he can stick at SS and be a neutralist defender that's plenty valuable. Being clocked at 4.1 isn't subjective. That's borderline plus speed from a RH hitter. I am probably with you on most of Hoerner's tools being 2nd division though. The hope is that the 45 power turns into 55 down the road with launch angle stuff, and that the speed/instincts will allow the 50 arm to stay at SS. There's also the hope that the 55 bat can slightly bump up to 60. We aren't talking about a superstar even if everything aligns perfectly, but the sum of the parts is a 1st division starter with some luck and good player development. Yeah, I agree with that assessment. It's just hard to know what the final product will look like or how he'll develop over the next couple years. He might get instruction/guidance on how to field better/make his arm stronger/alter his swing and use his lower-half to hit for more power. He should get a little bit stronger naturally as he matures, but he's pretty close to physically maxed out. Also, the most important tool for me for a position player is the hit tool. You have to hit (or be crazy good defensively) to stick in the big leagues and sometimes plus hitters develop some game power that goes beyond their raw power. No one projected Mookie Betts or Jose Altuve to have this much power. They certainly don't show it during BP. If Hoerner's hit tool is really special maybe the power comes down the road. Also, launch angle stuff can help like in Bote's case, but I don't want to mess with his swing. Last thing is speed can be measured, but I didn't have a time and I haven't seen one online. A 4.1 time to first is very good and matches what I saw on film. Should be rated a plus in running if that's his normal time. Also, seems like a better runner underway once he gets going like KB. I don't expect him to be a prolific basestealer but maybe his instincts are really good. We'll have a better idea next year once he gets promoted (or starts the season) to AA. Last edited by Regular Show on Wed Oct 31, 2018 8:22 pm, edited 1 time in total. I knew I had read the 4.1 somewhere. Apparently it was "consistently 4.1-4.2". Even at 4.2, Law's version of "below average" is ridiculous. I want to talk to some scouts and ask them what his normal range is because 4.2-4.1 time to first for a RHH is actually plus to plus-plus (70) territory and I'm not sure Hoerner is that fast. Maybe Law just caught him on a bad day? I like Law's scouting reports and he's generally very good. I think I only disagree with his notes/scouting reports occasionally and it's usually over a draft prospect. Hrubes20 wrote: Being clocked at 4.1 isn't subjective. That's borderline plus speed from a RH hitter. Fair enough but the only place I’m seeing this mentioned is a very Cubs prospect friendly Cubs fan site. I don’t actually doubt Hoerner has some straight line speed to his game, we’re talking a healthy 21 YO pro athlete coming out of a major uni’s sports program, but doubt Law would just randomly say what he said. As far as I can remember he’s the only national guy to both observe and write about Hoerner post-draft too so to dismiss it as casually and quickly as positives get embraced seems rushed. As someone who thinks there is a little more power to be had, hoping for above average ML power is alot. Sure Altuve and Betts made big gains but not so coincidentally both guys, elite minor league hitters, saw their power explode when the league’s run environment exploded. Hoerner won’t get the benefit of such a sudden and dramatic shift in hitters’ favor, nor does he have the body of work those guys built before breaking out. As a huge fan of sum of their parts first division starter, the best kind of player really, my question is whether he has the parts? Basically we’re hoping he maxes his power and hit without going backwards on speed and defense despite a frame where the room for growth is in the lower body and scouting reports aren’t so high on the tools. Nico won the fan vote and will be playing in the AFL all star game Saturday, which will air on MLB Network. A quick perusal of the draft forum for pre-draft coverage showed MLB.com said Hoerner ran “fairly well” and PG said he ran “above average” at the Cape. The Fall League seems to have more well above-average runners than usual, which helps explain why teams are averaging 1.5 stolen bases per game this fall, up from 0.9 in 2017. There's no true consensus as to who has the best speed in the Fall League, but Pache earns as many 65-70 grades on the 20-80 scouting scale as anyone. He's still learning to steal bases after getting caught eight times in 15 regular-season attempts and swiping just one bag in his first 13 AFL games, but his quickness definitely plays in center field. Others considered: Buddy Reed, OF, Padres; Lucius Fox, SS, Rays; Taylor Trammell, OF, Reds; Luis Robert, OF, White Sox; Estevan Florial, OF, Yankees; Luis Barrero, OF, Athletics; Julio Pablo Martinez, OF, Rangers. No mention of Nico among the fastest runners in the AFL. So that doesn't mean he's slow or below-average in terms of running; just not among the most elite runners in the AFL (according to Jim Callis). On a good note, Nico is mentioned in the "others considered" for Best Hitter. Vlad Jr. won Best Hitter and Best Power (no surprise there). Nate Pearson won Best Fastball. I ... don't know if I care all that much about Nico's speed. Law's usually not going to that far off the walls, so I'd guess he either caught Nico on a bad day, or that Nico made some poor runs. Speed and baserunning aren't exactly the same thing, and Law's comments were about him being a below-average runner. That said, put it this way - I just don't think Nico's speed is going to end up being the breaking point of whether he's a major leaguer or not. Not an issue to quibble over, but I think a positive case for Giambrone is more Todd Walker than Mike Fontenot, as I think he might have a bit more pop than Fontenot ever consistently had. toonsterwu wrote: I ... don't know if I care all that much about Nico's speed. Law's usually not going to that far off the walls, so I'd guess he either caught Nico on a bad day, or that Nico made some poor runs. Speed and baserunning aren't exactly the same thing, and Law's comments were about him being a below-average runner. That said, put it this way - I just don't think Nico's speed is going to end up being the breaking point of whether he's a major leaguer or not. That's actually a pretty good point. And considering it was only a few months ago pre-draft that Law himself stated Hoerner had above average speed, that makes much more sense than Law now trying to claim that he has below average speed. I guess I just assumed all the "baseball instincts" and "baseball smarts" talk included his work on the bases. That could have been a poor assumption. Hrubes20 wrote: That's actually a pretty good point. And considering it was only a few months ago pre-draft that Law himself stated Hoerner had above average speed, that makes much more sense than Law now trying to claim that he has below average speed. I guess I just assumed all the "baseball instincts" and "baseball smarts" talk included his work on the bases. That could have been a poor assumption. With their top pick for 2018, the Chicago Cubs opted for the bat of Stanford University shortstop Nico Hoerner and it hasn’t taken long this fall season to see what made him so attractive. 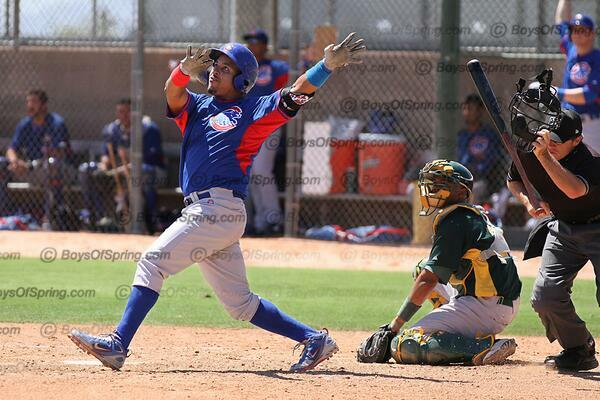 The 6-1 shortstop jumped three levels in his first summer with the Cubs organization, ending the year with Class-A South Bend. Although he wasn’t known for home run power in college — hitting a total of 10 dingers over his three-year career in the Pac-12 — he’s shown some raw pop at the plate since arriving in Mesa. With speed as his selling tool, Hoerner makes good use of his body and his defense has caught Marson’s attention. Again, not with something as objective as speed. It's quantifiable and competition has zero effect. The only way someone could drop from above average to below average in speed in only a few months is due to injury or insane weight gain. Or the evaluator just did a terrible job. Hrubes20 wrote: Again, not with something as objective as speed. It's quantifiable and competition has zero effect. The only way someone could drop from above average to below average in speed in only a few months is due to injury or insane weight gain. Or the evaluator just did a terrible job. sounds like it's falling in the dirt . . . When considering speed in a baseball context, it's exactly as identifable as pitching velocity. One uses a radar gun, the other a stopwatch. Or Statcast for both. Just because one is defined more often does not mean that another is less identifable. But you're smarter than to make this argument. You know that pitching velocity can be altered by about a million mechanical things, as well as arm health and such. The same does not apply to speed. Name one 21 year old who not only got slower, but TWO levels slower, in 4 months without sustaining injury or gaining a ton of weight? It just doesn't happen. That's why I think toonster's mention is probably spot on. Law surely wasn't talking about speed, but the all-encompassing "baserunning". There have been plenty of players that had insticts and IQ off the charts in other aspects of the game, but weren't good baserunners. Yeah at this point we have to give Law the benefit of the doubt in that he was talking about overall baserunning, and not just speed. Literally everyone else who has seen him play pre-draft and post-draft agrees that he has really good speed. Yeah, and Statcast isn't perfect either. I mean that guy isn't running in a straight line out there. How are those computers supposed to tell? You simply cannot accurately identify the speed of a two different moving objects. Baseballs are round and small. Human beings are a completely different shape and much, much larger when you measure them. The Fall Stars Game is tonight at 7 pm on MLB Network. Nico Hoerner and Bailey Clark will be playing but neither is starting.